The adhesive electrodes are applied to specific muscle groups that may be affected by pain and inflammation. Also known as EMS, Electrical Muscle Stimulation is a form of electro therapy that uses a special type of electrical current to stimulate specific muscles. With strategically-placed electrode pads, low levels of electrical current excite the targeted muscles producing rhythmic contractions. Low Volt – For reducing muscle spasm and pain relief. High Volt Galvanic– Muscle spasm reduction. Interferential– Pain and inflammation reduction. 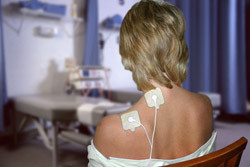 Iontophoresis – A pain and swelling reduction technique. Micro Current – Increase cellular metabolism to enhance healing. We choose the approach that best matches your particular clinical presentation. What Does EMS Feel Like? At first, the electrical impulses can produce a slight tingling sensation. The impulses mimic the signals normally coming from your nervous system, causing the muscles to contract. As your body accommodates this muscle excitation, the intensity of your treatment may be slightly increased for maximum effect during the course of your 10- to 20-minute treatment.